Turn Customer Data Into Dynamic Print Marketing. Using Today's Modern Print Technology. It's about connecting what's been disconnected in our digital world. Studies show that corporate email communications yield very low click through rates, averaging about 12%. While there are many contributing factors to this, the main reason? They are not relevant. Because of this our in-boxes are constantly inundated and because emails are easy to delete, unsubscribe to, or sent to spam, many just get ignored. AMP moves away from the "inbox" and gets back to the "mailbox". Dynamic print creates an ongoing loop of acting, measuring, listening, and responding that hits the right audience, with the right message, at the right time. We do it all through data-driven marketing so it comes together with minimal effort on the part of the agency. AMP is a great way to stay relevant and on-budget while opening the door to new creative ideas that will keep you ahead of your competition. Creative Business Solutions Never Had It So Good. Think about relevant articles, personalized content, even swapping artwork based on industry, location, age, etc. Even change the page count within a print run if you have less or more to say to a specific demographic. The possibilities are truly endless. Magazines are a great way to build your brand with current customers because they already have a relationship with you and are willing to spend the time to hear what you have to say. Plus your clients will tend to keep a magazine around in the lobby, at home, employee break room, or even waiting room magazine rack... another way to get even more exposure. 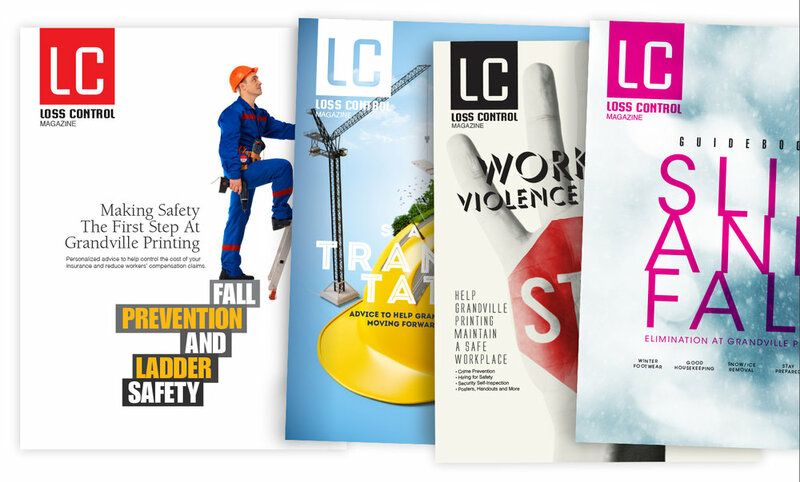 Magazine Example: Each quarterly magazine is personalized to the recipient and contains relevant articles, specific agency/agent information, personalized graphs, tips and business safety plans, survey reply cards, and more. The personalization comes from the clients data. 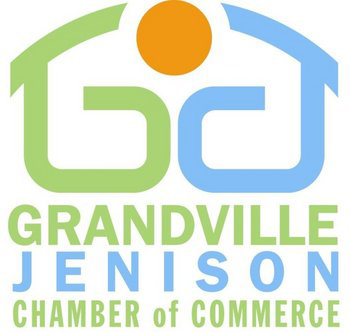 The GPC data and marketing teams connect the dots to deliver a finished product. Because Every One Is Unique. AMP allows all existing content to be 1-to-1 for each recipient. What does this mean? It means that every print pixel can be different on every page. This concept is what marketing people have been waiting for. A dedicated way to reach every customer, one at a time. How is it done? Once we map your data to our system we can turn static content into dynamic content. This includes going far beyond just adding their name. Based on data triggers we can swap images, generate graphs, pull specific content, the list goes on and on. The end result engages the reader like no other medium can. Every Piece Can Be Unique. Using your data, brand assets, etc. you can personalize your content directly to the recipient. This goes far beyond gimmick marketing to engage the reader in creative ways. Response rates and reader engagement increases nearly 10x using dynamic content. Marketing With A Little Personality. AMP makes it simple to send creative postcards that put relevant agent information in front of customers, perfectly timed before their renewal date. Consistent touch points are the key to success. When marketing is not your core-competency, getting a dynamic campaign up and running can feel like a monumental task. Many times because of the perceived complexity, companies do what they've alway done and opt for traditional print solution such as a trifold letter in a window envelope. AMP solves that problem and delivers relevant and data-driven personalized content that has a far more positive effect on your bottom line. Postcard Example: Results from AMP retention card mailing yielding a 97% retention rate from participating agencies, in contrast to the average renewal retention average rate of 87%. The card was targeted to "at-risk" auto insurance clients and we focused on saying "thank you" for being a customer, even sending a $5 Starbucks gift card. See the results here. Direct Mail That's Truly Direct. That's The Power of Personalization. We want to help be the change because AMP drives each customers unique experience. We manage all the elements allowing you to manage the results. Let us handle managing your data records, graphical assets, and content to create and deliver dynamic content when it needs to arrive in-home. Newsletter Example: Personalized to each construction industry customer explaining common back injuries and tips to prevent them. Each recipient also receives a chart showing their workers compensation back injury claims against the national average for the same industry. What Else Can AMP Provide? 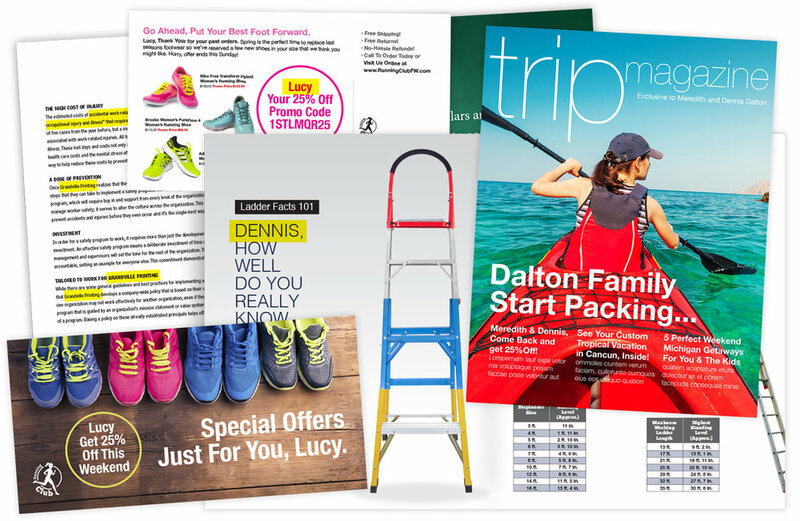 If you are sending out print marketing today such as newsletters, brochures, magazines, holiday cards, postcards, letters, AMP is a perfect fit. AMP lets you drive your customers experience by delivering a unique, optimized message because we've built our Agency Marketing Program to use your existing customer data to personalize, manage, and send out with very little effort. In other words, we manage the work so you can manage the results, making it easy to go from your 'to-do list' right to your customers mailbox. We'd love to hear from you. Send us your contact information and our AMP team will set up a short working session with you to answer any questions. Thank you, the AMP team will contact you soon.